So as promised, I am posting today to show off my spiffy new binder. :) About 2 weeks ago, I got the urge to organize every aspect of my home. I started buying new shelving units, more of those colorful fabric square bins from Target that I can’t stop collecting and we re-bunked our girls’ beds and gave their room a little mini makeover (Andrew’s room is up next!) I also wanted to organize my papers. This Summer I kept everything pretty under control but I knew once school started up this past week, I would begin to get buried in papers again. Plus I use to love organizing a new binder in school and it’s been a while. I needed a paper project. :) I searched online for ideas but I didn’t love any of the printables I was seeing. I guess it’s the graphic designer in me. I knew I had to create some of my own with the colors and images I wanted. And so I did just that! I’m sure you already know this but just a little disclaimer: no two people’s binders are going to look alike. Of that, I am 99% certain. We all run our households differently. We all have different ideas of what works for our family and what doesn’t. The way I organized my binder may not be how you’ll set-up yours. And that’s ok. I am also not going to share each area page-by-page because A- they contain some important personal information and B- that would be *way* boring. my pack of printables, naturally! possibly a dry erase marker. I’ll explain why in a bit. Here’s the tabbed portion of my organizer. I used two types of tabbed dividers. Why? Because I’m random like that. The patterned ones are a heavy cardstock-like material. They were actually folders. Not with pockets mind you. Just plain, creased folders with thick tabs built into the edges. I cut them right down the seam because the folder aspect did nothing for me. I just liked the pattern on them. I found all of my supplies at Target by the way. These were on the top shelf near the office supplies. They had a few packs with different patterns on them. 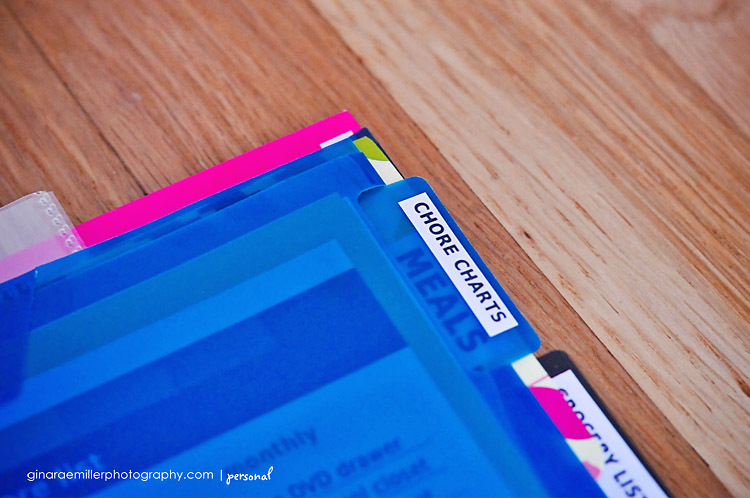 I used colored, semi-clear tabbed folders for sub-pockets inside of the bigger dividers. 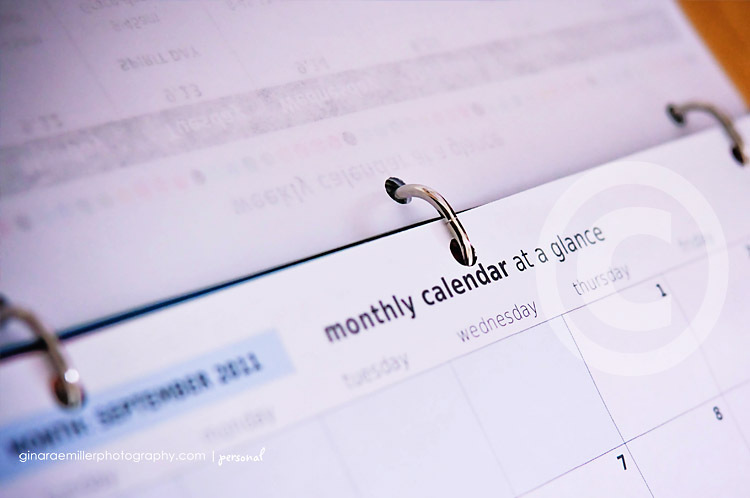 Example: a Daily Planner tab inside the Calendar section. Inside of this red acrylic folder are a few copies of my Daily Planner so I don’t have to print one off each night. Our very first sheet is an Important Phone Numbers (pack 1) contact sheet. Some people might file this under a Contact tab. I decided to put it front and center so the kids could easily find it. Of course it makes sense to put your most useful tab first. For me, those are my Calendars. I printed and punched holes in my Weekly & Monthly Calendars (pack 1) as well as my Weekly Menu (pack 2 – one of my favorite sheets!) I also printed off copies of these for my fridge. The kids love checking and seeing what’s for dinner early in the week. There are some acrylic sub-folders in here too. I guess I could have called this section Calendars & Charts. In one sub-folder, I have Chore Charts (pack 1). I printed off a few copies of these so I don’t have to print every day when I want a fresh one. 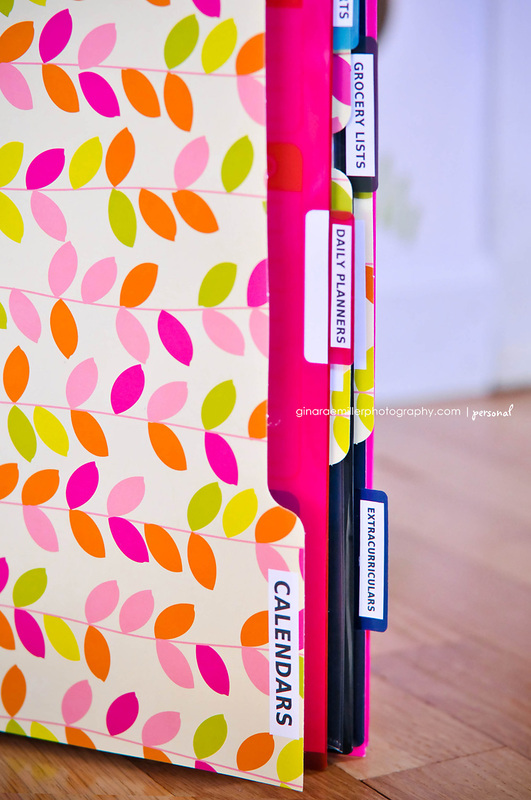 There’s also a sub-folder filled with Daily Planners – love these! (pack 2) I love having my weekly and monthly calendars to refer to but I find that every night before bed, I usually end up breaking down my following day on a scrap of paper. Now I have a sheet to do just that. Everything has a place. Once it’s filled out, I stick it on my bulletin board in the kitchen in plain view and easily referred to all day long. Next is a Finances tab. Inside here are copies of my Bill Organizer (pack 1). There’s room to jot down each bill as it comes, the amount it’s for and when it was paid. I had some spare 6×12 page protector pockets sitting unused to I ended up adding one in here and marking it Bills. I am not sure I am going to keep this though because truthfully, I don’t want to mess up my current bill organizing system. I think I will change the label on the pocket to read Receipts. I rarely keep receipts. I think now I’ll start. After Finances is a tab for Meals. I enjoy cooking but sometimes at the last minute, I just can’t remember what dishes I like to prepare. I get stuck in a rut so to speak, so I decided to create a quick list of all of our family’s favorite meals (desserts too!) The Favorite Meals and Favorite Desserts printables (pack 2) are both stored in plastic page protectors. 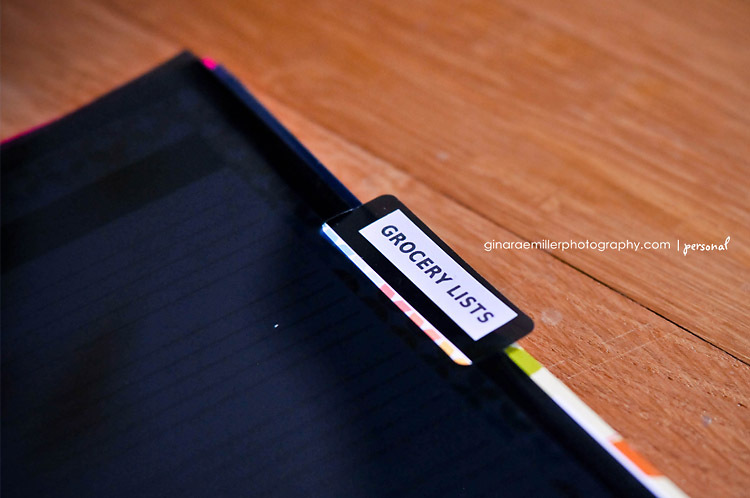 There’s an acrylic sub-folder labeled Grocery Lists (pack 1). As with the Daily Planners and Chore Charts, I printed off a few copies and stuck them in this folder to have on-hand when I need them. I included another one of those 6×12 page protector pockets and labeled it Coupons. You could also use a zippered pencil case for something like this. I would have preferred one but surprisingly enough, all of the school supplies at Target had been picked through and bare. I still may replace my 6×12 pockets with pencil cases once I can get my hands on some. I realize some people may not want to use their binder to house recipes, but I decided it’s important that I do. If I don’t have a meal stored in my head, I find that I am digging through recipe books, my MAC’s documents and various websites to find my favorite recipes. So time consuming! So all of the recipes I listed on my Favorite Meals and Desserts sheets are going to be stored in this binder, behind the appropriately named Recipes tab. Everything in one place. That is the point of the organizer after all! I waffled back and forth about sticking the Weekly Menu in this section but ultimately, that’s something I want to look at daily, so it remains in the front Calendar tab. Towards the back of the binder I added a Kid Info tab. I kept it in the back because this is where I placed my folder and I wanted that to give some support to the papers laying on it. 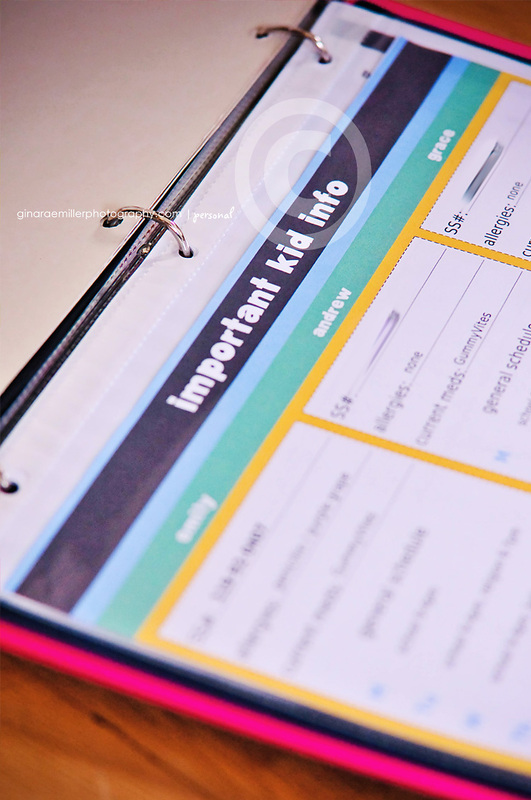 In here is a Kid Info Sheet (pack 1) that I filled out, printed and stuck in a page protector. It has the kids’ allergies, schedules, teacher’s names, etc. I also have My Big Book Lists (pack 2) printed for each kid. This is an easy way to keep track of what they’ve read. There are also Babysitter Info Sheets. Print one and fill out the next time you leave your kids home with a sitter. There’s room for all of your child’s special snacks, bedtime routines, etc as well as a place for you fill in your contact numbers in case you need to be reached. Here’s another idea for all of these printables: print, slip them in a clear page protector or laminate them and write on them with a dry erase marker! You can use and re-use each sheet as many times as you wish. 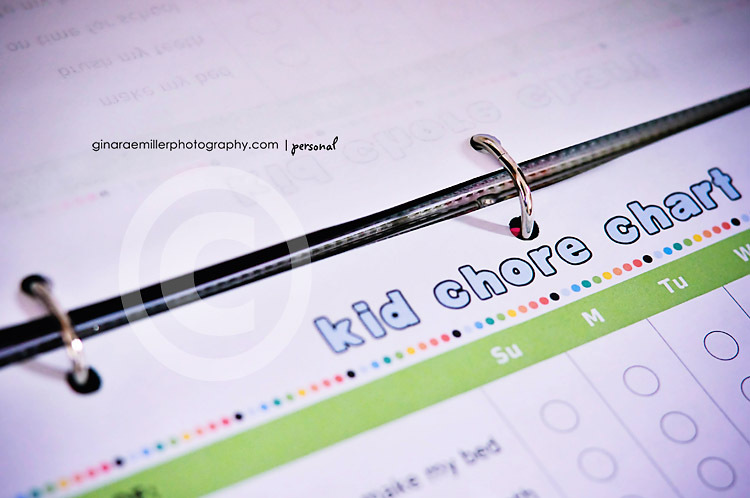 I plan on doing this with the Kid Chore Charts. 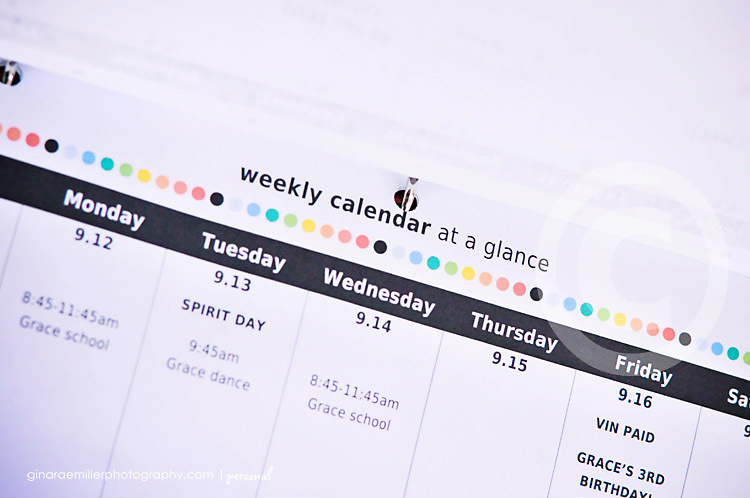 The kids can easily check off or color in the circle bubbles I included under each day of the week every time they finish a chore. I included an acrylic sub-folder in this section for Extracurriculars. We always have forms floating around after we register them for sports, dance, etc. This can be a quick catch-all for those. My hot pink folder at the very end of the binder is for School Papers. I may not keep them all in here because I need to keep important ones stuck to my bulletin board in plain site. Instead, I may make a photocopy of the more important papers and keep a record of them in this binder. Here are a couple more shots of my family binder. I included two colorful custom covers in pack 1. I used one of those, trimmed it up and matted it on bright blue cardstock. I bought a white 1″ binder with the clear front pocket so it was easy to create a simple cover and stick it in there. And that’s it! Cute right? Do you feel more organized just reading this post? Have I scared you away? LOL I hope not! I know it’s only been a week but I really have to tell you that this binder and all of my printable sheets have come in so handy these past few days. It’s been smooth sailing in the Miller house! I haven’t showed all of my printables here – and I still have many more I plan on creating. This binder is most definitely a work in progress. There’s a really cute Pinterest Project Tracker in pack 1 that I can’t wait to use. There’s an Important Dates sheet in pack 2 broken down into months so you can add birthdays and anniversaries you don’t want to forget. I may grab a 3rd pencil case or even one of my acrylic tabbed folders and put it right behind this list to store Blank Cards. I would love to hear what you think about my Family Organizer Binder Kit – Starter Pack! Leave a comment here. Perhaps I’ll send you the first two sets – a $16 value – so you can create your own cute binder too! To be considered for the drawing, comments must be left by noon on Sunday September 11th. Lastly, what sort of sheet would you like to see possibly offered as a free download here? It can’t be anything already included in one of the packs (I think I listed them all above). Anything else you might find useful? I’d love to hear about it! Make sure to read my product description because I tried to lay out as many details as possible as to what is included. There’s also a clickable link within the description that you may want to follow to download the same font as me. 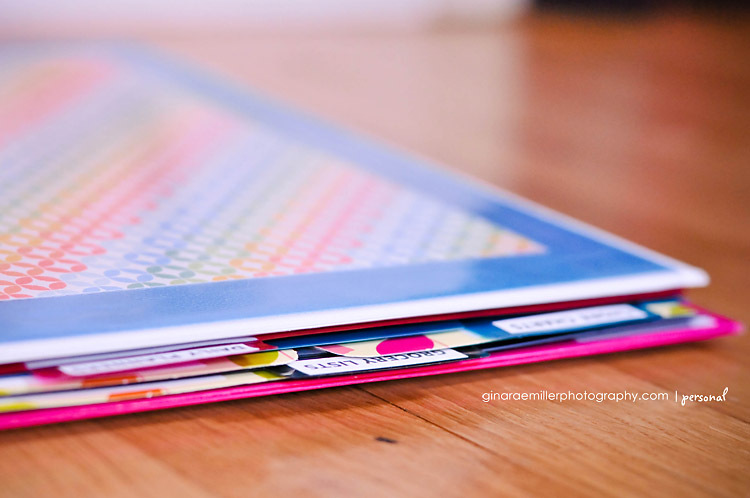 Printables come in both .PSD and .PDF format. Great ideas! How about a baby feeding/diapering chart? I have a boring one I created in excel and print off at the beginning of each week. At first I created one for each day but now I use one sheet per week. You have so a great work and i hope you make a 2nd part with notice.. adressbook and all…. Oh, sweet jesus…I am IN LOVE! Now, print out a complete binder for me and just send it my way. ;) I’ve been pinning these on pinterest for a month now and haven’t gotten around to doing one. I am so glad you put one together! (and SUPER cute too!) Love it! As for another sheet…how about one for pet information? Vet phone #, kennel phone #, vaccinations, medications, etc…I always have the hardest time keeping track of my dogs’ information and it is a pain to find it when we have to take them to the kennel! ;) Have a great weekend, sweets! This looks really good Gina! I printed my free copies but I have not had time to use the ones that I can personalize yet. I still have a lot of work to do on mine but I printed what you emailed and I do have them in a binder. I need to purchase dividers though. I currently have all of my recipes that I have printed off of the internet or cut off of a food box all stored in a large baggie and it is really bugging me. I am thinking about making a second binder just for my recipes. I think it would be really neat if you could make something for that or even for a coupon binder. I would love to see sections for types of dishes or types of coupons. I have a coupon binder and a home binder at this time but I want to use your sheets only so I have a lot of work to do on mine. 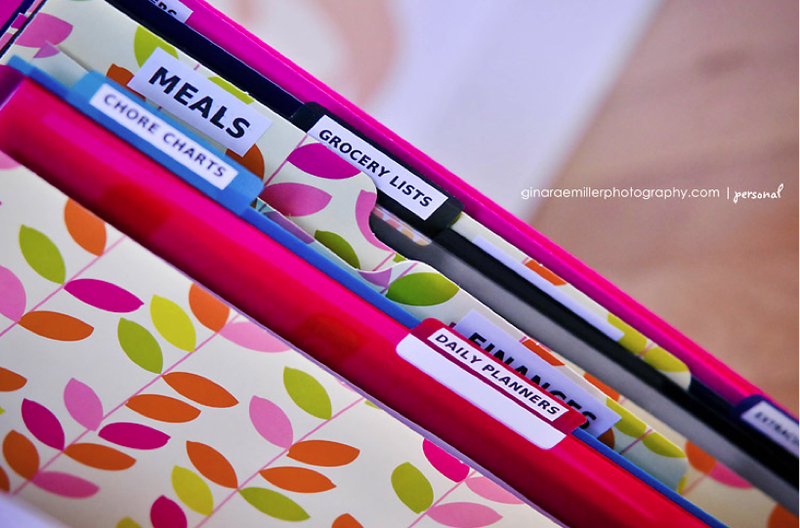 I love to have everything in one place but I think I am okay with having a home binder, a coupon binder and a recipe binder mostly because I like to take my coupon binder everywhere and my recipe binder would be on my kitchen counter while baking. I would love to use the printables you created because like you said, to brighten them up a bit. ;) I would be happy if I won the free set. :) Have a good weekend! This turned out super cute, Gina! Address book is a good idea too! And Christmas is coming – how about packs for Organizing that? Love love love these… Thanks for inspiring us ALL and thanks for sharing! Wow, this all looks amazing! I have the potential to be an organized person :-), meaning that I WANT to be one. It just doesn’t seem to happen :-) Something like this would sure help though! I LOVE this! I feel like my life is chaos right now and I only have a 5 month old! What am I going to do when I have school aged kids…and more than one!! OH goodness! I Need this in my life! 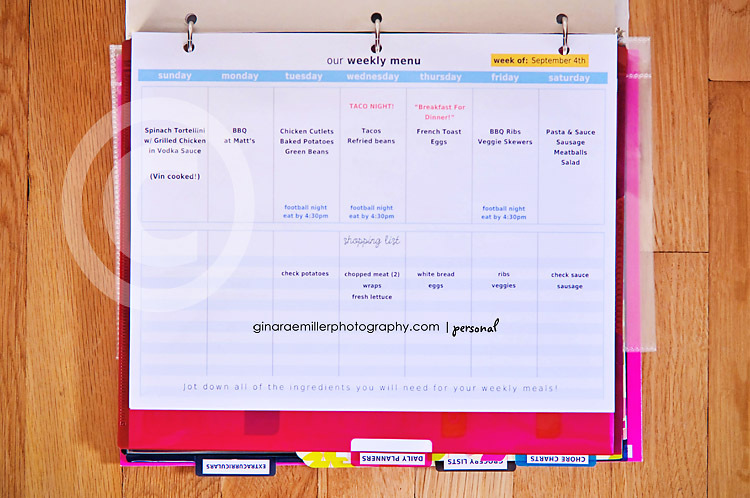 YOu could do a workout sheet… or perhaps a food diary page. Or a gifts and holiday planning page? I love this set and cant wait to make my own binder! Hopefully it will help get my life under control somewhat! Wow and I thought I was doing good with my school binder I made up for this year (trying to keep track of school stuff for 4 kids), but man your organization puts mine to shame!!! Awesome job, love it!!! This is exactly what I’ve been looking for! Thank you for sharing all of your hard work with us! I already bought pack one, but would LOVE to win pack 2! Can’t wait for that weekly meal planning! My suggestions would be a personal food journal…it would have a place to mark off daily water intake as well! Thanks again for sharing! I posted what I’ve finished so far on my blog. I LOVE LOVE LOVE this whole set/idea/system!!! I just gave birth to boy #3 this week, and with three kiddos under age 3 I’m feeling in DIRE need of some organization!!!! Here’s a couple of my ideas for an additional sheet: something to track dr appts and/or medications; List of fave blogs/websites; layout idea tracker (place for sketches, photo ideas, product ideas, etc). Or anything to do with keeping up with little ones!! I would totally love to win the whole set, but might break down and buy the first one this weekend so I can get started! I LOVE the colors and the “family” planner idea. I am trying to figure out how to implement in my world. I know I should embrace the weekly menu, but it is so hard to think about sitting down and doing that (that is why I am a mess lol). The website tracker and pinterest is awesome. Is there a task list? How do you implement this system with the electronic world??? Beautiful!!! Love the colour combination, and the range of sheets included in the kit, Gina. A suggestion might be a ‘Wish List’ for birthdays and Christmas. I love how you put this together. I’ve been wanting to make a family organizer for awhile and this makes it very easy to pull it together. Love this Gina!! I’ve been seeing these on a few other blogs I read, and really should start one for my family! Thanks for the inspiration and ideas. A Christmas card list and gift idea section would be something I would definately use from year to year, always so unorganized in that area! OH MY GOSH! These are amazing… I cannot tell you how many times I invisioned making something like this and this is EVEN BETTER! You are an amazingly talented person! Gorgeous! Great job Gina!!! Sure wish I would have known you were doing this.. I’ve been working on my personal planner (smaller version) for over a month.. It’s a lot of work. Much easier to print and insert what you created! I’ll be blogging about your kit! I started seeing the “Home Binder” idea popping up on Etsy and started looking around for ideas and was just getting started when you started posting about it, too. So…now that you’ve done all the work, I’d love to have your printables to make my own binder!! Great job, Gina! I love them, Gina! I’ve been trying to get more organized and have really been utilizing the calendar and alerts on my phone. Nicely done!!! I’m definitely not motivated to go the distance, but you have inspired me w/the idea of a binder for sure. Absolutely awesome. I just got divorced and am looking at learning to do things by myself and trying to get organized. This looks like a cheerful way for me to do that. Thank you for showing us your creativity. A loaned to/borrowed from page might be useful. I just love this idea Gina! I’m hoping that you come out with some cleaning checklists and maybe a morning/evening routine (a la Fly Lady… LOL)! These are a lifesaver! I can’t believe I’m actually organized…you have made an organizer out of the unorganizable…<~~~and yes, I realize that is not a word. LOVE this, Gina! I’d love to see a party planning sheet – a place to house ideas for menu, decorations, games, etc. This is such a great idea!! You can never be too organized!! I hope you create more pages!! LOOOVE these Gina! I have been printing and organizing all day!!! I would loooooove to see a sheet for keep track of creative assignments actually. Most of us are scrappers and I am sorely unorganized in that area and I think it would be a nice little thing to put in with my weekly calendars. Maybe have a space for product/kit to use…when it’s due by and then a place to put when you upload it?? Just a thought!! I just love these! oh! And I LOOOOOOOOOVE the Christmas List idea!!! I need that desperately! This is just what I’ve been waiting for! When my kids (5) were growing up I couldn’t of done it without my own organization charts. I used to write them out and take them to the printer (pre-computer days). So great of you to make it easy for all the young moms. Such cute pages…can’t wait to start my own binder. My kids are 16, 14, and 10 and I have been trying for about 10 years to get more organized. Today’s the day!!! What a great organizer!!! so creative ad perfect for what I am looking for! 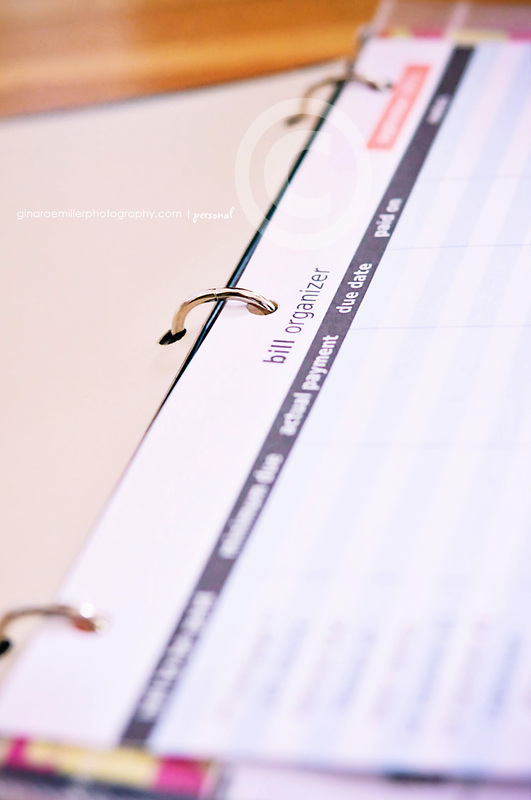 With the new year beginning one of my goals for the year is to organize and your family binder tips are great, so great that is the first project I’m going to tackle. Thx for sharing your ideas. Thank you, these are great ideas! By any chance do you have the templates or print outs for the calendars and other lists you did? or where can i get some? ?